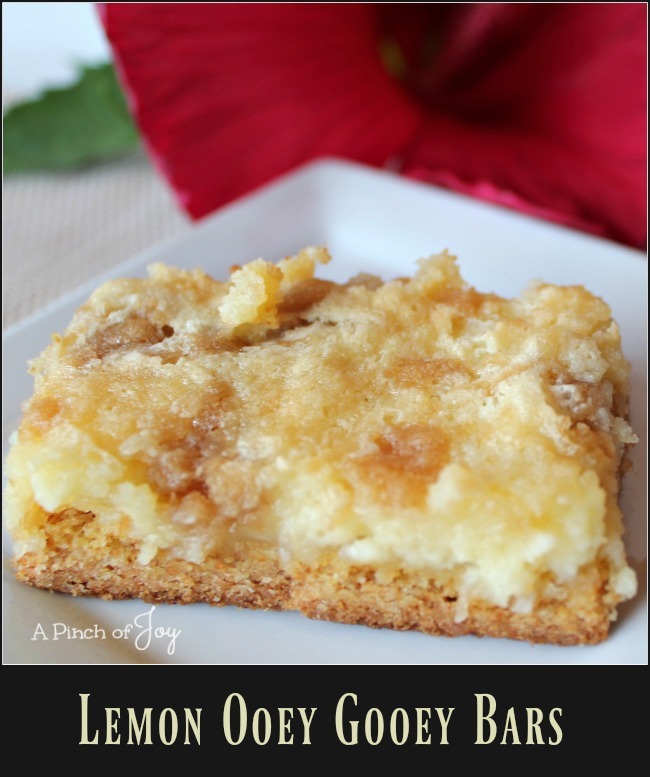 With the tang of lemon, the rich creaminess of the filling atop a thick crust, finished with butter crumbles Lemon Ooey Gooey Bars is a baker’s reward! Since it makes 16 servings, it is a good dessert for a potluck or serving a large group. It always disappears quickly. It takes about 20 minutes to make this and another 35 to bake. Cooling is the hardest part. Restrain yourself for a couple of hours and you will be so happy you did. Just not burning your tongue is a good thing, but the real favor you’ve done yourself is the enjoyment of the flavors and textures on that unburned tongue. Store overnight in the refrigerator and the flavor deepens and is even better. It will keep up to three days in the fridge – assuming it doesn’t disappear before that. 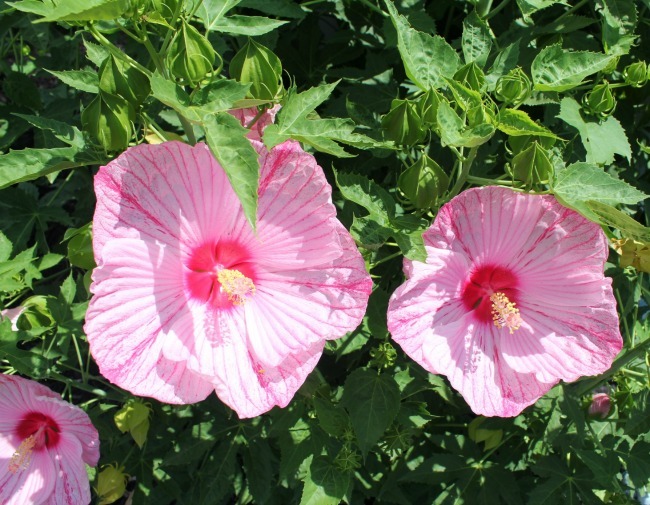 To go along with the goodness of Lemon Ooey Gooey Bars — The gorgeous red flower behind that delicious dessert is a hibiscus, one of two in our backyard planted by the previous owner. They die down to the ground in the winter, shoot up huge stems in the spring and by September they are eight foot tall. In mid-June they begin to bloom. The flowers are enormous, almost gaudy in their brilliance. The blooms only last one day and both the red bush and the pink bush are always loaded. Those green tear drop shapes behind the flowers are part of the crop for the next day. Three dozen flowers on each bush is a slow day! Never experienced a flower quite like this before – so just had to share. With the tang of lemon, the rich creaminess of the filling atop a thick crust, finished with butter crumbles Lemon Ooey Gooey Bars is a baker’s reward! Pour cake mix into a large bowl. Add egg and melted butter. Stir until well mixed. Pat into bottom of prepared pan and set aside. Melt butter in microwave. In a small bowl, mix the brown and white sugars, coconut and flour. Add butter and stir until mixture becomes crumbly. Sprinkle crumbs over the filling. Bake for 35- 38 minutes. Edges will be just golden and topping will start to appear dry. The center will still appear gooey, but not liquid. Do not overbake.